As overfishing threatens the entire ecosystem around the world, fish are diverting themselves into rough waters. The Food and Agriculture Organization (FAO) states that nearly 28% of the fishery sector is over-exploited (beyond its maximum sustainable limits) and an additional 50% is fully exploited (at or close to those limits). This destruction and ensuing downfall would pose a commercial threat not only to fishers, but also to everyone else whose livelihood depends upon fisheries. According to FAOSTAT fisheries sector provides employment to 180 million people and accounts for a significant part of the animal protein consumed globally. The global size of the shrimp market was US$ 37 Bn in 2016 and is estimated at US$ 39 Bn by the end of 2017. By the end of 2027, the global shrimp market is expected to reach a value of more than US$ 67 Bn at a CAGR of 5.6% from 2017 to 2027. In terms of volume, the global shrimp market was pegged at 9,119 KT by the end of 2017, and is expected to reach 14,259 KT by the end of 2027 with a CAGR of 4.6%. Growth in the demand for seafood products is a major factor driving the market of a wide variety of shrimp species. Globally, consumers are changing their food habits by opting for healthier food products such as shrimps, salmon and tuna. Seafood is considered a healthy source of animal protein over other meat products, which is enhancing the global demand for shrimps. Growing urban population in emerging economies is driving the demand for seafood products. Moreover, the rising tendency of spending on seafood products is expected to drive the demand for various species of shrimps during the forecast period. Moreover, the setting up of a variety of food-processing plants by manufacturers in various regions is expected to boost the demand for seafood products. The regulations governing the setting up of these plants in various regions are favourable, which is likely to contribute to the growth of the species segment in the global shrimp market. The shrimp industry is witnessing significant growth with an increase in the production of shrimps from inland farming, areas that use fresh water and focus towards the usage of certified organic shrimp production in key shrimp-producing countries. These factors are contributing to the future growth of the shrimps market over the forecast period. Since the past decade, the Brazilian shrimp market was stagnated despite the country being the leading exporter of shrimps in the Latin America region. Factors, such as shrimp diseases, poor quality of shrimps, floods and droughts, had decimated the growth of the shrimp market in the region. However, in the recent years, improvements in shrimp farming technology and increasing domestic demand for shrimp products in Brazil is driving the demand for shrimps in the seafood market. The growing consumer demand for frozen seafood products is a major contributor to the growth of the global shrimp market. It is stated that almost three-fourths of seafood products consumed in the U.S. are in the fresh and frozen form. The demand for shrimps and various seafood products among U.S. consumers while preparing seafood at home and even while ordering seafood in restaurants has increased remarkably. The main reason being shrimps are available at cheaper prices and have high nutritional content. Other seafood products, such as salmon, tuna, crabs and lobsters, are struggling to hold a high market share due to increasing prices and lower supply. Seafood is a staple diet in several parts of the world. Seafood is majorly consumed by people living near the sea shore. This has resulted in the formation of a strong consumer base for shrimp products as a large percentage of this population depends upon seafood as a source of daily protein intake. On the other hand, there are several regions where, due to lack of availability of other types of food products, there is an increasing demand for seafood. This is also contributing to the growth of the global shrimp market. Importers of seafood products have to follow strict rules and regulations of the U.S. Customs and Border Protection (CBP). For instance, products such as shrimp in peeled and deveined form should be appropriately labelled and should meet the CBP’s guidelines. Hence, products from several countries are rejected if they fail to fulfil these requirements. This is expected to reduce the imports of shrimps, which is likely to restrain the market to a certain extent. The global shrimp market is primarily characterised by the presence of a large number of regional and multinational companies. An approximate share of 35-40% is held by multinational players that offer a wide range of shrimp-based products in the global seafood market. North America and Western Europe are the two regions mainly targeted by these companies due to the increasing per-capita consumption of shrimps in these regions. Companies, such as Surapon Foods Public Company Limited, Nippon Suisan Kaisha, Ltd., Charoen Pokphand Food PCL, Trident Seafood’s Corporation and others, are some of the major companies operating in the shrimps market. Regional players and local players account for a market share of 30-35% and 25-30% respectively. Primarily, these players are operating in the Asia-Pacific region and their major target audience are consumers seeking healthier and high-quality seafood products. The key stakeholders in shrimps market are focusing on expansions & investments as a key business strategy for business growth and development. They are focusing on product development by offering frozen shrimps to cater to the demand from the retail market. In May 2017, High Liner Foods Inc. acquired Rubicon Resources LLC, which is engaged in the import and distribution of frozen shrimp products in the U.S. retail market. In February 2017, Charoen Pokphand Food PCL acquired 15% of the equity interest in Ningbo Chia Tai Agriculture, a company that offers livestock, poultry farming and feed production services. For this purpose, it took help from Chia Tai China Investment, an investment holding company. In 2016, Charoen Pokphand Food PCL expanded its distribution channels into six types, which include 5-star business, Chester Restaurant, CP Kitchen, CP Fresh Mart Retail Store, CP Food World and Community Refrigerator. In 2016, the company launched Pork Community Refrigerators Project to give consumers full access to fresh, safe and clean pork products. In 2016, Charoen Pokphand Food PCL collaborated with AG Processing Inc., one of the leading soybean businesses in the U.S., for the project “Collaboration to develop a sustainable soybean sourcing system” for the feed management of shrimps. In 2015, the Maruha Nichiro Corporation merged six main companies into a group and changed its trade name to Maruha Nichiro Corporation. In March 2016, the Royal Greeland A/S acquired Quin Sea Fisheries Ltd., a Canada-based prawn and crab company, to increase the revenue of both the companies. In June 2014, Alliance Foods Company LLC (Asmak) signed a contract for five years with “The Market,” a retail outlet at Mushrif mall in Abu Dhabi, for the supply of fresh seafood products, majorly shrimps. Under this contract, the company planned to open five outlets in the mall, which were to be divided into sections for seafood, meat, fruits and vegetables. This was expected to help the company increase its customer base. The company has a high production capacity for a variety of shrimps. This report provides the forecast and analysis of the global Shrimps market. It provides the historical data of 2012, along with the estimated data for 2017 and forecast data up to 2027 in terms of revenue (US$ Mn) and volume (MT). The report also includes macro-economic indicators, along with an outlook on shrimps for the global market. It includes drivers and restraints of the global shrimps market and their impact on each region during the forecast period. The report also comprises the study of ongoing industry trends and opportunities for the shrimps market. It also includes the key regulatory scenario of the shrimps market. 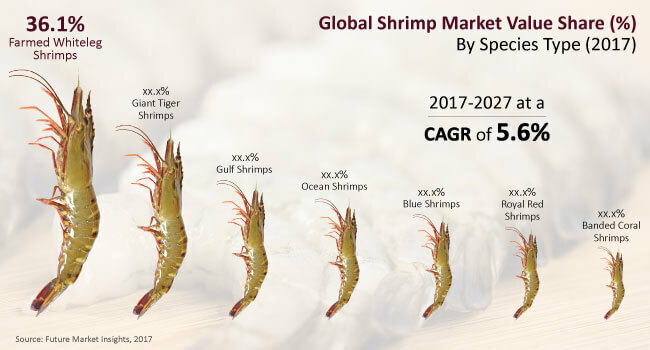 For providing users a comprehensive view of the shrimps market, we have included detailed competitive analysis, along with key players in the market, and analysis on the strategies followed by them. The competitive dashboard provides a detailed comparison of shrimp manufacturers on the basis of revenue, product offerings and key strategies. The study encompasses market attractiveness analysis by source, species, application, form, distribution channel and region. A detailed study of the shrimps market has provided our analysts an observation of the shift towards the consumption of shrimps over the forecast period. Consumers are increasingly preferring shrimps over other seafood products. The demand for shrimps among consumers for the preparing seafood at home as well as while ordering seafood in restaurants has increased as it is available at cheaper prices and has high nutritional content. On the other hand, other seafood products, such as salmon, tuna, crabs, lobsters, etc., are struggling to hold their market share due to increasing prices and lower supply. A number of primary and secondary sources were consulted during the course of the shrimps study. Secondary sources include Factiva, Hoovers, U.S. Food and Agriculture Organization Databases, ITC Trademap for export-import statistics and various government statistics & publications. This report covers market dynamics related to the shrimps market, which include drivers and trends driving each segment and opportunities in the shrimps market at the regional level. The report also includes analysis and insights into the potential of the shrimps market in certain regions. Detailed profiles of the providers are also included in the scope of the report to evaluate their long-term and short-term strategies, product portfolios and recent developments in the shrimps market. Some of the key players analysed are Charoen Pokphand Food PCL, Maruha Nichiro Corporation, High Liner Foods Inc., The Clover Leaf Seafoods Family, Nippon Suisan Kaisha, Ltd., Royal Greenland A/S, Blue Star Seafood Co. Ltd., Wild Planet Foods Inc., Ocean America Food SA, Rich Products Corporation, Siam Canadian Group Limited, DNI Group LLC, Surapon Foods Public Company Limited, Pacific Seafood Group, Morubel, Trident Seafoods Corporation and Sirena A/S. The report includes the company profiles of key manufacturers of shrimps in North America, Latin America, Western Europe, Eastern Europe, Asia-Pacific excluding Japan, Japan and the Middle East & Africa. All key applications of shrimps have been considered based on secondary sources. Some of the key data points involved in the modelling approach include the seafood industry scenario, aquaculture industry scenario and fresh & frozen seafood outlook. The market has been forecasted based on constant currency rates. The data for the global shrimps market is estimated in terms of value and volume consumption. To arrive at the volume consumption of shrimps, the production data of countries that produce various types of shrimps was obtained from various stats across the globe and then taken into consideration. In addition, the production of export-import stats were referred for deriving consumption analysis. The data of the per-capita consumption of shrimps was tracked through various secondary sources for data validation. Furthermore, Future Market Insights estimated volume data on the consumption of shrimps for several countries by understanding the demand and supply of shrimps. This includes the analysis of the production, growth, volume & value sales, transition, pricing, population, consumer preference and consumption of shrimps among end-user verticals. FMI then derived the volume consumption of shrimps across various regions, including North America, Latin America, Asia Pacific excluding Japan, Japan, Western Europe, Eastern Europe and the Middle East & Africa. Forecasting is done using an internal proprietary model using different macro-economic & industry-based demand driving factors that impact the market and its forecast trends by identifying and allocating a weighted score to forecast factors that influence the demand for shrimps. These factors were the representative of an entire value chain, as well as the macro-economic indicators such as production, which have been taken into consideration to arrive at the volume consumption of shrimps in respective countries. The weighted average selling price of shrimps was considered to estimate the market size for top shrimp-consuming countries. These prices were captured in their respective countries and then converted into USD to offer forecasts in one consistent currency standard. The pricing of shrimps keep on fluctuating due to the demand-supply gap, excess of production in some countries, shrimp farm production and variations in the seasonal production of shrimps. Given the characteristics of the market, FMI triangulated the data based on the supply side, demand side and the dynamics of the global shrimps market. To develop the global shrimps market forecast, FMI analysed various factors to understand their respective impact on the target market. However, computing the market across the abovementioned segments is more a matter of quantifying expectations and identifying opportunities rather than rationalising them after the forecast has been completed. It is imperative to note that in an ever-fluctuating economy, we not only provide forecasts in terms of CAGR, but also analyse on the basis of key parameters, such as year-on-year (Y-o-Y) growth, to understand the predictability of the market and to identify the right opportunities. Another key feature of this report is the analysis of the global shrimps market and the corresponding revenue forecast in terms of absolute dollar opportunity. This is usually overlooked while forecasting the market. However, absolute dollar opportunity is critical in assessing the level of opportunity that a provider can look to achieve, as well as to identify potential resources from a sales perspective in the global shrimps market. To understand key segments in terms of their growth and performance in the global shrimps market, Future Market Insights has also presented a market attractiveness index. This index is expected to help providers identify existing market opportunities in the global shrimps market. The report covers an in-depth analysis of all components of the value chain in the global shrimps market. In the final section of the report on the global Shrimps market, a competitive landscape is included to provide a dashboard view of global shrimp manufacturers.